There are several groups of greenhood orchids which occur exclusively in sw Western Australia, or are particularly diverse in the West compared to the eastern states. For my PhD I am looking at a broad overview of pollination across all types of greenhood orchids, so it was important to work with some of the types of greenhoods that are found only in Western Australia. Top of my list were four different species, all fairly common and found in and around the Perth Hills, or just to the east. I haven't yet had a chance to go through all my data so its a bit premature to talk about any results. Instead, here is a visual collage of my four study species showing the remarkable variation in flower shape even among closely related orchids. The flower shape and structure plays an important role in luring the insect into the trap mechanism, thereby allowing pollination to occur. The whole plant of the bird orchid [Pterostylis barbata]. The rosette of leaves extending up the stem is characteristic for this group of orchids. Something fantastically odd must be going on with these bird orchids...how does a shape like this evolve?! Unfortunately we were not successful in locating pollinators this trip. Reason to visit again next year! The frog greenhood [Pterostylis sargentii] grows in drier forests throughout the wheatbelt area of WA from Geraldton in the north to Esperance in the east. A close shot of the wonderfully weird frog greenhood [Pterostylis sargentii]. The labellum (the dark knobby bit) actually consists of three lobes, with the two outer lobes meeting at the top to form the overall shape. Although it looks like one part from the side, the lobes are not actually fused together at the top. The crinkled leaf snail orchid [Pterostylis sp.] is a diminutive, colony-forming greenhood which grows in wetter jarrah forests in the Perth Hills and to the south. Snail orchids as a group are generally very small...the flowers of this species are about 1 to 1.5 cm tall. 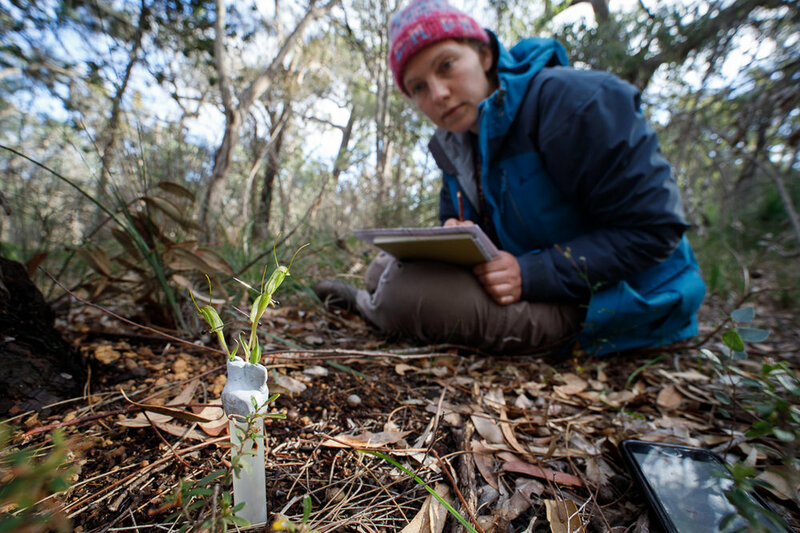 Ali measuring pollinator (fungus gnat) behaviour in response to snail orchid flowers. Here, we are trying to work out if pollinator behaviour changed if we manipulated the shape of the flower.